LONDON, England - Manchester City have withdrawn a $150 million bid for Brazilian superstar Kaka, according to arabianbusiness.com. Uncertainty hangs over Kaka's future at AC Milan. A source close to the club's Abu Dhabi-based owners told the Web site: "The deal is off, and the offer is no longer on the table. The club is now pursuing another striker which it is very close to signing. Manchester City is about to unveil a new striker, but he is not called Kaka." But Kaka could be interested in a move to Eastlands after all despite earlier claiming that he wanted to stay at Milan, according to press reports Thursday. Italy's Gazzetta dello Sport said that the 26-year-old's father was set to hold talks with City officials. Meanwhile, the Sun claims Kaka could join City providing an exit clause in his contract would allow him to leave should the club fail to meet any of four key criteria: a) City qualify for the Champions League within two years; b) fellow Brazilian Robinho stays at Eastlands; c) Kaka's representatives retain sole ownership of the player's image rights; and d) City owner Sheikh Mansour continues to invest substantially in the club. Kaka's agent, Diogo Kotscho, said: "If Manchester City come to an agreement with Milan we will talk to them - but it is not just about money. They have to show us that this is a project that we will be interested in." Manchester United have joined the list of clubs interested in signing Wigan's Wilson Palacios, according to the Sun. Wigan have rejected £10 million from Tottenham for the Honduran midfielder, although the Mirror says Spurs will return with a £14 million offer. The Times reports that AC Milan are close to clinching a £7.5 million deal for Liverpool's Daniel Agger. The Danish defender's agent is in Milan for lunch with club officials with Agger set to utilize an escape clause in his contract. The Gazzetta dello Sport reports that Milan have also reached an agreement to sign young Brazilian defender Felipe Mattioni from Gremio. In Spain, Marca reports that Getafe goalkeeper Roberto Abbondanzieri is on his way back to Argentina to join Boca Juniors in a euros 300,000 deal. Back in the Premier League, the Mirror says Bolton have bid £5 million for Fulham's Jimmy Bullard. Bolton manager Gary Megson also wants Benfica striker Ariza Makukula on loan. 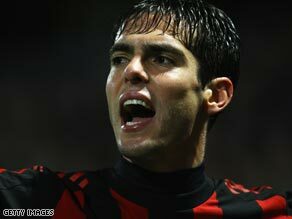 Is Kaka worth $726,000 a week? Have your say in the Football Fanzone debate. i think kaka is one of ythe best layers in the world and his person, his faith is just wonderful. he's the total package and any club would be privrleged to have him on board. yes, i think it would have been a good deal signing off the goal machine, but its now even better that the deal is off!imagine after spending such huge sums of money and this guy does not deliver as expected or even he gets injuries!! spending half that money on a good player like Micheal Owen would have been a better plan, I suggest.